Consistent output depends on flawless material handling. The more seamless the movement of materials, the more efficient the production process. Bardons & Oliver-built Machine Tools include loaders and unloaders that are customized for the size and type of material your solution requires. We can also improve or integrate our systems into other manufacturers’ equipment. Our fully automatic loading tables keep stock in your machine at all times, which allows one operator to run multiple machines at once. Our tables load one length of material after another into the machine and then automatically crop a predetermined length off the leading end and eject the remnant end. An additional magazine storage area can be extended with buck-type loading systems or simple table extensions with gate arms for isolating a bundle break area. All handling equipment is designed with unitized construction, allowing for simple modifications to meet your specific requirements. CNC control allows programming of exact lengths and minimizes tube waste by allowing multiple part lengths to be cut from the same tube. Our automatic unloading system supports long parts during feedout and machining of back-end weld preps, chamfers and cutoff operations. Short parts, such as bearing races, gear blanks, piston rings, cylinder liners, transmission parts and spacers can be picked off during cutoff and retracted from the work area, stripped off the pick-off and discharged down a chute. Proper handling from start to finish is assured with our diverse unloading system options, built to fit your specific needs. Our engineers work with each customer to design and implement the best systems for their unique application. These material handling systems allow your bars and tubes to load and unload precisely at the right time in the production process. As a certified FANUC robotics system integrator, Bardons & Oliver similarly integrates robotic and industrial automation solutions as an opportunity to further streamline operations. 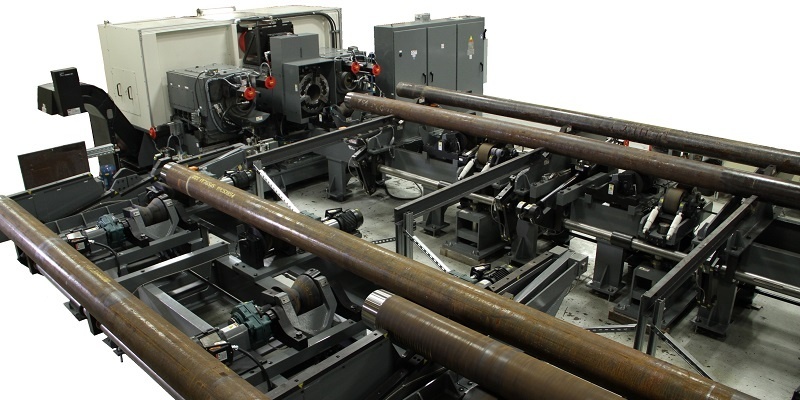 We’re the experts who can handle any length of incoming or outgoing tube or bar, eliminating the need for sawed blanks and shortening response time. Our unloader systems have staging discharge tables to ensure uninterrupted production time, allowing operators to focus on other tasks. Your business depends on quality and efficiency. Our decades of product and systems development can help you deliver on both. Bardons & Oliver’s employee-owners focus on solutions. Our engineering expertise, technical skills and support capabilities produce the customized Machine Tool or system you need.